Scientists established a new procedure to evaluate the ability of Earth system models to simulate various cloud types in the tropics. Due to a scarcity of useful observations to guide model development, Earth system models often miss the mark in predicting tropical clouds and their effects on incoming and outgoing energy in the atmosphere. For most of the past two decades, the U.S. Department of Energy (DOE) Atmospheric Radiation Measurement (ARM) Climate Research Facility, a scientific user facility, collected data at three surface sites in the Tropical Western Pacific (TWP) to improve the data record in this sparsely sampled region. Scientists at DOE's Pacific Northwest National Laboratory analyzed the ARM TWP data to evaluate Earth system model results. They found that model errors in cloudiness are dependent on model resolution, which can further lead to errors in ambient temperature and humidity and, in turn, feedback on clouds. Marine boundary layer convection and tropical clouds—key elements of the global energy balance and water cycle—remain an important source of uncertainty in understanding tropical cloud feedback processes and climate sensitivity, and predicting Earth system changes. The long-term ARM TWP data sets provide an excellent resource for evaluating Earth system models using both statistical and process-oriented approaches and to reduce errors in cloud treatments. This measurement-to-model approach can be easily adapted for evaluating new schemes being developed for the Community Atmosphere Model version 5 (CAM5) or other Earth system models. Atmospheric moist convection in the tropics redistributes heat, moisture, and momentum globally. Recent generations of Earth system models have underestimated the coverage of tropical low clouds but overestimated their thickness and cooling effects. This is referred to as the "too few, too bright" tropical low-cloud problem. Compensating for this problem by adjusting estimates of different cloud properties may reduce the total error in energy budget estimates but hide other problems in model representations. Researchers used ARM's long-term TWP data sets to evaluate CAM5's ability to simulate the various types of tropical clouds (i.e., convective vs. liquid or ice stratiform), their seasonal and diurnal variations, and their influence on surface radiation, as well as the resolution dependency of modeled clouds. Increases up to 20 percent in the modeled annual mean total cloud cover were attributable to the large overestimation of stratiform ice clouds. Higher-resolution simulations reduced the overestimation of ice clouds, but increased the underestimation of convective clouds and low-level liquid clouds. Compared to the meteorological sounding data, the cooler and more humid air simulated in the model also caused overestimation of clouds at all altitudes. Comparing the modeled occurrence of convective clouds against ARM observations revealed the model deficiency in triggering deep convection too often, which affects the vertical transport of vapor and injection of liquid and ice to the upper air. This error manifested itself in the out-of-phase cloud diurnal cycle simulated by CAM5, causing the inaccurate vertical distribution of stratiform clouds. Sponsors: This research is based on work supported by the U.S. Department of Energy (DOE) Office of Science, Biological and Environmental Research (BER) as part of the Atmospheric System Research and Earth System Modeling programs. 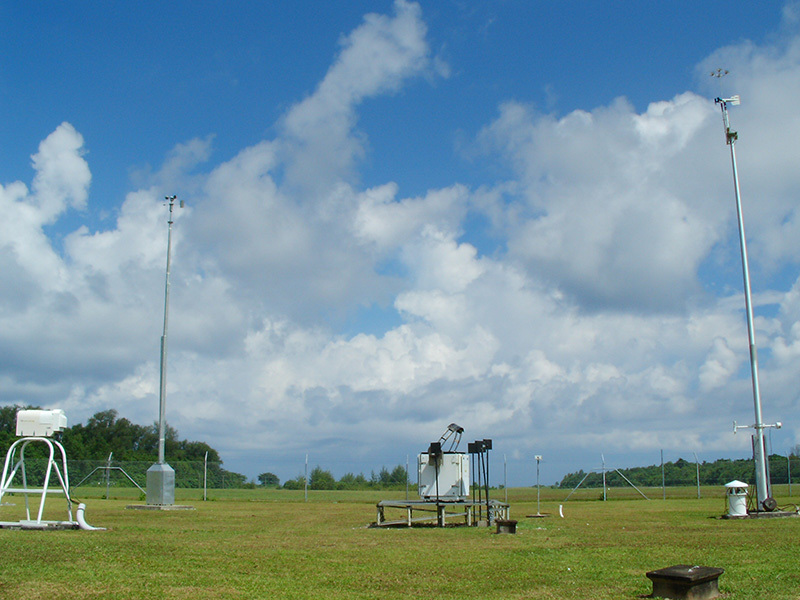 User Facilities: This research used data from the Atmospheric Radiation Measurement (ARM) Climate Research Facility, a DOE Office of Science user facility. The research used computational resources at the National Energy Research Scientific Computing Center (NERSC), a DOE Office of Science user facility located at Lawrence Berkeley National Laboratory, and the Environmental Molecular Sciences Laboratory (EMSL), a DOE Office of Science user facility sponsored by BER and located at Pacific Northwest National Laboratory.